God has not put the treasure into the earthen vessel merely for the vessel’s own sake, but that the treasure may afterwards be poured out from it, that others may thereby be enriched. Spurgeon’s remark well illustrates his strong belief in passing on to others what he had received from the Lord. He was concerned that faith, essentially a simple thing, was often portrayed in a manner unlikely to be of help to the genuine enquirer. 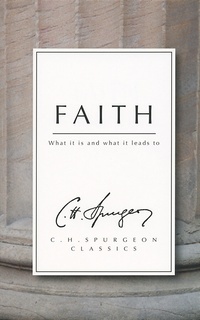 Faith - What it is and what it leads to gathers together Spurgeon’s thoughts on the subject, presenting a clear view of the exact nature of Christian faith and affording a glimpse of his great concern for those who had not yet put their trust in Christ.